Mayor Rahm Emanuel, Comcast Executive Vice President David L. Cohen and United Way of Metropolitan Chicago President and CEO Wendy DuBoe, along with civic and community leaders, today kicked off the third year of the Comcast Internet Essentials program. Through this program, the number of low-income Chicago families who now have broadband connection at home doubled to 14,000 as part of the nation’s largest and most comprehensive broadband adoption initiative for low-income families. The partnership also established “Internet Essentials Learning Zones,” which brings community based organizations together to eliminate the digital divide. 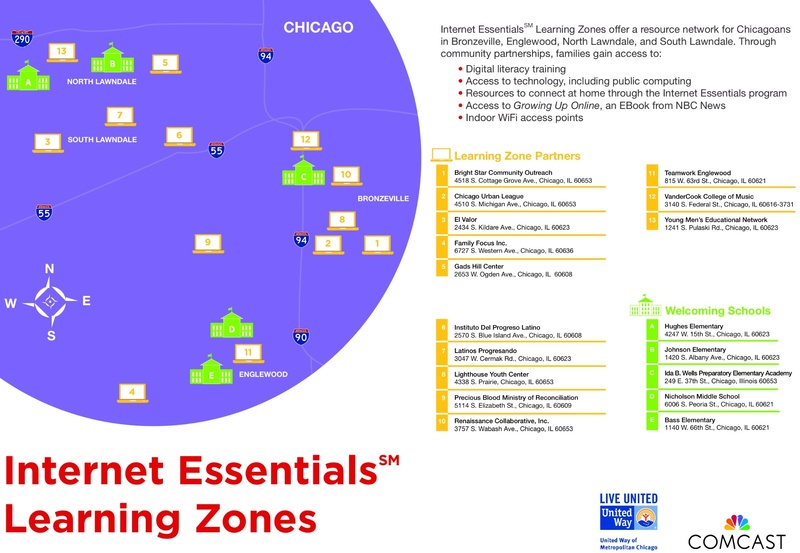 This year, the City of Chicago and Comcast, in partnership with the United Way and more than a dozen leading community-based organizations, will launch the first “Internet Essentials Learning Zones” in the nation. The zones will incorporate neighborhoods with large concentrations of Internet Essentials-eligible families surrounding five newly-designated Chicago Public Schools “welcoming” schools (Bronzeville/Mayo Elementary; Englewood and West Englewood/Bass Elementary and Nicholson Elementary; and North Lawndale/Hughes Elementary and Johnson Elementary). Internet Essentials helps close the digital divide by providing eligible families low-cost broadband service for $9.95 a month. Families also can purchase an Internet-ready computer for less than $150 and access digital literacy training sessions and materials online, in print and in person. The momentum of Internet Essentials continues to increase. In the first 22 months of the program, Internet Essentials enrolled upwards of 50,000 new families every six months. In the first six months of 2013, 70,000 new families signed up. In addition, Comcast has distributed more than 18,000 subsidized computers; trained nearly 20,000 people; publicized the program in more than 4,000 school districts and more than 30,000 schools; broadcast nearly 2 million public service announcements and partnered with nearly 7,000 community based organizations, agencies, and officials – about 1,900 alone here in Comcast’s Greater Chicago Region – to help spread the word about the program. 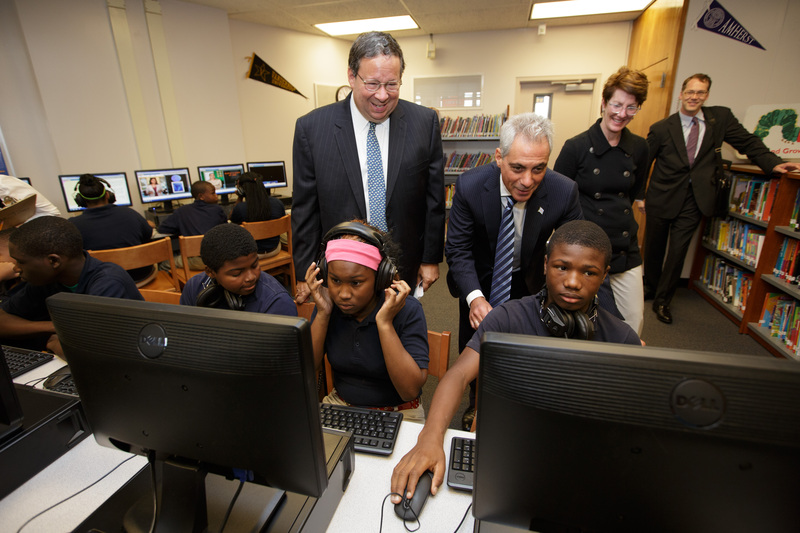 (L-R adults) David L. Cohen, Chicago Mayor Rahm Emanuel, and Wendy Duboe, President and CEO of United Way of Metropolitan Chicago, visiting the computer lab at the Johnson School of Excellence in Chicago. The city is investing in the success of these welcoming schools in many ways, including in technology enhancements. Students in these schools will have access to computers and mobile devices, which will provide electronic access to textbooks and information, and they’ll be able to take notes and complete their school work on the devices. The zones will help bridge the digital divide and extend learning beyond the school day by connecting the dots between Comcast, the United Way, the Smart Chicago Collaborative, participating community organizations and school-based leaders, all of which will work in partnership to enhance access to broadband and provide technology training beyond school walls. Comcast also announced updates to Internet Essentials for 2013. Comcast has more than tripled the download speeds for Internet Essentials customers since the program’s launch and further streamlined the enrollment process. Community partners are now able to help connect low-income families to the Internet by purchasing Opportunity Cards that can be used toward the cost of paying for Internet Essentials service and a new online application tool on InternetEssentials.com and InternetBasico.com makes it is now easier and faster for a family to apply for Internet Essentials. Program eligibility criteria also expanded for the second time, to include parochial, private, cyberschool, and homeschooled students. Now, nearly 2.6 million families nationwide are eligible for Internet Essentials.